This morning I encountered a co-worker on my way into the building. We exchanged customary greetings and acknowledged that I had, yes again, ridden to work. I mentioned that if the weather says like this I’ll be in good shape for riding all winter. He suggested that if the weather stays like this “we’ll all believe in global warming.” Heh, heh, he’s not aware of my (this) dirty little secret. Coincidentally I was checking out the “Watershed: The Blog” blog and found this interesting post on the long range winter outlook. There’s a 55 to 60% chance that our winter temperatures will be warmer than usual. Imagine that. And you just have to love the quote from NOAA Administrator Lautenbacher, we’ll have “boughts of winter.” So, this is what it’s come to, Spring, Summer, Fall, and boughts of Winter. And finally, Sunday’s issue of the local daily included a whole page about global warming. Two articles from the Seattle Times, three graphs, one diagram, and one photo of a former scientific skeptic perched like “The Thinker” on a globe. This quote adorned the top of the page, “The most important thing to realize is that most scientists didn’t originally believe in global warming. They were dragged – reluctant step by step – by the facts.” – Spencer Weart, science historian. Special thanks to Seattle Times writers for giving the local daily the necessary words, because if it makes our paper that means word is spreading. Which brings me to The Offical MinusCar Project slogan: “Enjoy global warming. It won’t last long.” You heard it here first. A green Taurus Wagon from county 61 had a little trouble this morning with a curb. So did a white Pontiac this afternoon. Today: a very special cars vs curbs episode of The MinusCar Project. There is a hill on my route to work. It’s a pretty steep hill. It’s steep enough that riding it knocks my speed down to 6mph. (I like to come here for interval training.) The speed limit on the road is 30 or 35 which puts most cars in the 40mph range. My personal quad-factor risk calculator (40% speed of vehicles, 40% speed of bicyclist, 10% width of road, and 10% volume of vehicles) puts this particular stretch of road in the red zone. I use the sidewalk to avoid inconveniencing a large number of fast moving vehicles. This morning, just as I was transitioning from sitting to standing on the pedals, a car came by me scraping two tires on the curb. The sidewalk here is directly adjacent to the road, there’s no grassy strip of separation, this vehicle was remarkably close as it went by. It’s possible, but probably (hopefully?) unlikely, that this driver was trying to teach me (by risking my life) a lesson about bicycling not being a safe activity, especially near traffic. The irony is that if I assume the best in this driver, the potential for disaster only goes higher. Perhaps the driver didn’t mean to come in contact with the curb. Perhaps they were distracted for a moment by a phone call or the newspaper, or their spilling cup of coffee. Or maybe they were shaving, and smoking and eating a doughnut and then their phone rang. When the driver is teaching me a lesson it’s clear that the driver knows I’m there and a conscience and relatively controlled decision is being made. When the driver is distracted disaster is avoided only by chance. The driver may or may not restore their attention to driving, and may or may not have time to restore control of the vehicle before it hops the curb. The legal repercussions between the two are unsavory too. If the driver is teaching me a lesson they can, for better or worse, be tried for assault with a deadly weapon. Scenario two is an accident. Clearly the driver didn’t mean to lose control of their vehicle while eating a doughnut, reading the paper, and taking a phone call resulting in the accident. Heck, the judge probably reviews cases and talks to mom each morning during his drive to work. Really, that’s normal car culture morning commute behavior. This afternoon while I waited at a red lighted intersection another car came in contact with the curb. Coincidentally it’s the same intersection that appears in the eighth post of this blog. I didn’t see the whole thing but this car appeared to have been forced to the curb as a result of another drivers errant lane change. The curb blew out the front tire as the lane changer continued on their way, seemingly oblivious to the wake of destruction. Why is it that stories like these are always used as examples of how dangerous bicycling in traffic can be? Can't they just as easily be turned around and used as examples of how dangerous driving is? 115 peopled died every day in 2004 in traffic related accidents. Today's news today: "Harrisburg crash victims were best friends, Police: Sioux Falls driver also killed after teens swerved"
I used this service to have a dialog with city officials this week. I commute to work by bicycle. I have been since June. My intent is to continue this bicycle commute through winter. I live on the ##### side of town and work in the ##### part of town. I use the bike trail at ##### and ride that and the dike (##### ) to cross the river at the ##### bridge. I then use the bike trail between ##### and the #####. As the temperatures get colder I become more and more interested to know if there is a bike trail snow clearing policy or directive. I'm also interested to know if I'll be lucky enough that the dike between ##### and ##### will be cleared. I'd be very appreciative if you address these concerns. Thank you. The Parks & Recreation Department does clear the bike trail of snow during the winter. However, during a snow event I have to send my park employees to the Street Department to assist with snow removal of city streets. The bike trail is the last area of the park system to have snow removed and it could be days before we are able to get to this task depending on how long my employees are assigned to the Street Department. We do not remove any of the snow on the levee on the westside of the river between ##### and ##### street. ##### - specific route details have been omitted. The Internets are dangerous places. No surprise, this is still great TV. I went searching for the Deadwood naughty word counts on the Internets. I found them here (caution: contains naughty word counts). Still, for scripting and characters it’s tough to imagine a better show. I read this one aloud with The Boy 7 over the course of a few days. It was pretty great to hear him respond “He’s right” when we got to the money line on our way through Horton Hears a Who. “A person’s a person no matter how small.” Not being a person of large stature himself, he probably knows a thing or two about it. The darn liberal media was cranking it out way back in 1954 already. We’ll watch Bill O’Reilly tonight for balance. They were here this morning. I must have left them behind when I transformed from worker bee to super commuter. Ugh! The ride home yesterday just wasn’t much fun. I blame it on the over consumption of the cream cheese/cherry pastry someone brought to work. Well, actually it was probably a combination of that and the cinnamon rolls someone else brought to work. I would have made the Fat Cyclist proud. I never had a chance to even sample the fresh baked banana bread that someone else brought to work. Food at work…it’s an issue. I shoulda skipped lunch. Not only did I have bad legs, before I realized I had bad legs I had already taken extended loop option A. By the time I arrived at extended loop option B my brain had apparently disengaged and I took option B while somewhere I heard a distant echoing voice suggesting I not do this. Or was it Obi-Wan suggesting I use the force? Full brain disengagement occurred somewhere in the Neighborhood of Spaghetti Streets when I found myself off my route on a road I hadn’t seen before, going a direction that isn’t on the compass. I think there was a car in the way where I normally turn and I didn't feel like quibbling about it. A few minutes later I put in a call to The Wife (Coach?). “I’m going to be later than usual; I’m not riding very fast.” Pick it up, she said. You’ve got time, she said. Dinner won’t be ready for another 15 minutes, she said. Uhhhh…I’ll be at least 25, I said. This is a wind speed graph. There’s a small uptick around 6pm from breezy to Rita. Yeah that was a head wind. And then things started to feel abnormally bouncy. And then things started to feel abnormally squishy. And then I flatted. And then I called The Wife again. I mixed up a healty batch of metaphor and cliché and told her when it rains it goes from bad to sour. I sat there by the river with 67 mosquitoes and fixed the tire. I made it home. Just in time for the departure of The Wife and The Boy 3. Bye. Just in time too, for some sweet and sour and cold meatballs. I’m MinusCar guy, and I’m just happy to be home. Woo hoo! Often the best I hope for is one or two more MinusCar trips than auto trips. This week came up unusually high. I ventured out for lunch most days this week giving me 3 MinusCar trips. Sunday helped too with the ride to church and a night ride (nights happen really early these days) with The Boy 7 to the neighborhood stop-n-rob for some milk and candy bars. Night rides are more fun! KT accepted my invitation to a Saturday meeting. The single occupant trip was between home and his house to ride together to the meeting. This also accounts for the miles on my car this week. Morning Temperature Lows: Morning temps were generally in the 40 range which is chilly but not remarkable enough to track or report. A local adult Sunday school class is following these FaithLink study guides. It’s a guide that “not only motivates Christians to consider their personal views on important contemporary issues, it also encourages them to act on their beliefs.” The important contemporary issue for today was American’s love affair with the automobile, and I was there as a show-and-tell to hopefully offer a little something in the form of encouragement. I offer a short description and criticism of the study guide below, but first it is necessary to mention how cool it was to sit with a group of people and dialog about many of the ideas found within this blog. The move from cyberspace to realtime/realpeople was refreshing. That this could happen on a Sunday morning was greatly encouraging as well. Of course, not everyone was comfortable with the topic. It’s highly likely none in attendance will begin riding a bicycle for utility, and I’m just guessing but I’m pretty sure there was at least one SUV driving mom with two or three kids amongst the small group in attendance. I’ve been used to that discomfort for a long time now…it takes me back to the the time my friend and riding buddy arrived to meet me for lunch…alone…in his Ford Expedition. The study guide began with cars and “The American Love Affair.” It segued quickly into the similarities and differences between Katrina and Rita, and “Class and Access” and who has cars (relatively rich) and who doesn’t (relatively poor). It moved from there to the high cost of gasoline and finally to a lengthy description of the (somewhat?/relatively?) bold “What Would Jesus Drive (WWJDrive)?” campaign. Unfortunately the guide ended by letting readers off the hook with a sidebar on the back page that contained statements from the guide authors describing how taking public transportation to their jobs would be unreasonable for them. Those kids do a pretty nice job. The best part about catching up on HP is that I’ll get to go to the next one as a date with my wife. This is a very funny movie for all the wrong reasons. Whatever Owen Wilson has, he’s got it good. Winter Route & Bikes Everywhere? As I begin to anticipate snow and the likelihood that my normal route to work will go unplowed I’ve begun to consider alternative routes to work. Today I pretty much settled on a new route, entirely on road, to get to work. It’s a half-mile longer than my preferred route. It’s has an advantage over my preferred route because instead of facing a 10-minute exposed leg directly into an artic wind, I get to vary north and west directions and be amongst the relative coverage of homes, trees and buildings. Additionally, I get 2 or so miles at the end of the ride with that north wind on my back. I reversed the route at the end of the day for the trip home and found it much less enjoyable. At one point I braced for what sounded and felt like a truck about to drive up my back. It’s a fast road…well it has a reasonable but ignored speed limit. The highlight of the trip home was passing three cyclists. I’m not talking about seeing three cyclists I’m talking about actual, “on your left,” passing. And I’m not talking about the local bike path; I’m talking about on the road. Quite cool. Two of the three were local cycling personalities: GGGGarth and a guy with a trailer with a traffic control barrel overturned for carrying goods. It's been a good day for discovering inspirational and informative articles on the art of bicycle commuting. First up - today I was performing my customary daily palm pilot reading of my blog friends while on the toilet. It's only a matter of time before the thing gets flushed. Seriously. Oil Is for Sissy's posted and lightly ranted about an article by Rivendell bicycle founder Grant Petersen. If you go to the post you should also read the comments, there are some very good ones. To Grant Petersen, regarding your first five opinions I say: bring it. Petersen's thoughts on clothing are very intriguing. Essentially, wear clothes similar to the drivers that pass you. If you look like a bike geek they'll run over you, if you look like their cousin Larry they will treat you better. That's an interesting bit of psychology that hadn't occurred to me. Unfortunately I quickly dismiss it as not practical for me, I haven't looked but I assume I’d be unable to find wind/water proof dress pants. I love this quote: "Riding never gets easier, you just go faster..." I first saw it attributed to Greg LeMond in a Mt Evans or Mt Washington Hill Climb ride report. It has replayed in my mind often. Second up - Cornerstone Life highlighted this Dirt Rag article. I had a hard time limiting my quoting, the second last paragraph is so poetic - "...making the new day essential, provoking, a nectar rather than a waste-treatment. This is about lifestyle, around which the physical act of cycling must inevitably whirl. It can be DIY, it can be embellished with chemicals, it can be stricken with poverty or uplifted with dirty money, but its foundation is always grease, dirt and blood. And personal success will only be sweeter if a crooked finger is kept on actual satisfaction, the sheer endorphin of experience that defines and galvanizes what you love to do, even if living it is a hard road." And the last bit describing the reaction of an inquisitor upon learning the distance of a bicycle commute - "There is always a pause after this, as if my interlocutor is trying to envision that distance, followed by an involuntary assessment of their current physical condition based on how they felt after climbing a flight of stairs at the mall recently, following a hearty round of Cinnabon sweet cakes." Yep, that was the barista at my coffee shop Monday. If you’re like me and you didn’t know something noteworthy was going to happen on David Letterman’s show last night you can go here to find a partial accounting of Letterman’s chat with Woody Harrelson from last night. Apparently Harrelson has been living a sustainable existence with his family in Hawaii for the past five years. This has not been a good week for my stocks. Everything is down big, including ENER losing 21% from its price. Here is an article about Energy Conversion Devices work toward viable hydrogen powered vehicles. The single occupant trip was a rainy day trip to the park-n-ride. It was nice to see that the lone red car is still parking and riding. I had a good week for being the coldest week in a very long time. The temperature will go a lot lower than it did, but many winter mornings will be quite similar to what I experienced October 6th and 7th. There were plenty of good laughs here, but I have a feeling watching The Daily Show is a fine substitute. I got the book because I don’t watch The Daily Show. I found all the snarky humor I expected. These are exciting times if you’re in any way connected to Lance Armstrong. These are especially exciting times if you’re connected to Lance Armstrong and you’re one of the people steamrolled when you didn’t measure up to the Lance standard. So it might be with Prentice Steffen, a former USPS doctor let go prior to 1999. Here are some Dan Osipow thoughts published by VeloNews on Thursday: “Prentice joined our team as an inexperienced EMT doctor…he continues to want to speak about us and jump and down about us, and clearly he has an audience and a platform. But within our team, when Prentice speaks it doesn't mean anything. Prentice is a non-issue." A Prentice Steffen interview was published Thursday in L'Equipe magazine. In the interview Steffen enjoyed his 15 minutes of fame by expressed his thoughts on Lance being a doping cheater, and also on the high likelihood of there being a large percentage of professional cyclists that dope. Apparently an over anxious Steffen failed to consider how his statements might affect the people he’s currently working with. Steffen is the team doctor for a developmental cycling team TIAA-CREF. This team is unique in that central to its existence is its desire to prove to its young cyclists that you don’t need to dope to win in professional cycling. On one had you’ve got a team founded on the hope that professional cycling success can be had without dope. On the other you’ve got the team doctor saying professional cycling success is not being had without dope. Prentice Steffen issued a retraction and apology today. This wasn’t the usual non-apology apology that we’re so accustomed to seeing. This is a real life acceptance of responsibility. I attribute the uniqueness of this apology to my belief that lots of people involved in professional cycling are in fact actual humans. I'm very surprised this is only the second time I've been able to post about bad experiences with drivers. When I started this I expected there would be a much higher frequency. While I was walking to lunch today a driver expressed his concern for my safety from the comfort of his 4,000 pound heated metal cage. As I was crossing a street (27,000 cars per day – yeah, I found a new data source) from behind me I think I heard “people have gotten killed doing things like that.” By “things like that” I think he meant just plain old crossing the street which is exactly true. Thanks for the tip. I’ve posted about posing a challenge to drivers before. Walking confidently and sometimes asserting my pedestrian rights. This incident was odd because I in no way perceived that I had posed any sort of challenge to him. I stood there in the street and applauded him for his fine performance. As he drove away I quickly finished crossing the street as my walk signal ran out. This week is a very important week for me. If I'm not riding when it’s 40 degrees then I won’t be riding when it’s 30 degrees. And if I'm not riding when it’s 30 there’s no way I'll be riding when it’s 20. These three temperature points make a pretty good summary of yesterday, today and tomorrow. So far, I’m feeling really good about the coming winter. What Not To Wear – I’m a geek, I have a spreadsheet that I keep for cold weather rides. I record temperature factors, what I wore (feet, hands, head, legs, torso), and my perceived comfort levels. I’m working hard to train myself to wear less to minimize sweat. Too much sweat means riding home in wet clothes which seems fraught with danger. Where Not To Ride – I’m experimenting with alternate routes to work. As I experiment I’m imagining what the roads would feel like if they were icy. I’m also preparing a personal petition to city government. Part of my normal commute includes a gravel dike. If it doesn’t get plowed this winter the most direct alternate routes to work include 40,000 car roads. There are other less direct routes with fewer cars but less direct has new meaning when it’s 0 degrees out. "Angry drivers call ‘bike safety’ an oxymoron - ‘Bad apples’ whip up tension on both sides of the windshield"
They even use the term scofflaws. Des Moines, IA - Des Moines is getting into the bikes/busses act. "The nearly $50,000 program will equip 80 buses with racks for two bikes each." Cool! I wonder what my city spent to equip 30(?) busses with the same. Oh, and 16,000 passengers ride daily in Des Moines, 200 ride daily here. Oh, and Ford made the finaly Excursion last Friday. I read it here first. There aren’t very many people riding the 8am route from the new bus station. The 10/4 12pm ride, not quite a record, was very full. I picked up The MinusCar Bike Project on the 4th. I departed the LBS, frame in hand, and headed for a nearby restaurant for lunch. As I walked in the door I realized I was heading into a new experience. Most people at restaurants have back seats and trunks. These are convenient places to store groceries, shopping bags and bike projects. I needed to bring my goods inside. This is highly unusual behavior. Most people inside settled for looking at me curiously. One man in line suggested the bike (just a frame) was going to be tough to ride if that was all there was. I shrugged his comments off and left his group and the cashier to finish their conversation about me. At that point I wasn’t necessary anyway. Following that the frame accompanied me on two bus trips. Upon boarding my half expectation that I would be denied a ride because bikes aren’t allowed on busses (they’re not) went unrealized. They were difficult trips in that I had a backpack with bike parts, the frame, and an umbrella. I felt an intense need to be very careful to not poke any eyes out as I boarded and departed the busses. The Wife was right, I should have gotten a smaller umbrella. The portfolio performed pretty well this week. Daystar Technologies continues to lag the others. It lost 10% this week. The other three each gained more than 10% which gives the whole group a $63 gain. On Friday Piper Jaffray "initiated coverage" on Evergreen and Energy Conversion Devices. While this won't necessarily make the stock price go up, I take it as an indication that analysts are taking an interest in the alternative energy sector. Single occupant trips included a rainy drive to the park-n-ride and a morning trip to the grocery store for milk. The car miles were previously detailed here. I recently discovered (what I should have realized) that there is good access to the dentist via the bike trail as well. That would have been a very nice ride for us, with him on the trail-a-bike. I really screwed that day up. So far the weekly bike miles aren’t going to get me very close to 10,000 miles for the year. Right now I’m at about 4,500 miles. I'm going to try to raise that average this week. Is It A Resturant? A Grill? A WHAT? As I rode to do the bicycle pick up of the boys at the end of the day today I found myself enjoying the pleasant aroma from the grill of a nearby restaurant. "Hmmm...wind's blowing just right today." A block later I enjoyed the pleasant aroma of grilling from a nearby residence. "Hmmm...somebody’s going to enjoy themselves some grilled vittles tonight." A block later I became alarmingly conscious that I had been enjoying the exact same scent of grilling for an unusually long period of time. Not 15 seconds later I discovered the source. It was waiting at the intersection for a green light emblazoned with a sticker inviting readers to visit www.greasecar.com. Yes, this was a vegetable oil fueled diesel Mercedes Benz automobile. I have gotten a whiff of the the future and it is the smell of grilled meat. I’m imagining a day when I can sit in traffic waiting for a green light and be surrounded by the smell of hamburgers. Or better yet, maybe they’ll figure out how to alter the scents. I’d like nothing better than to have the next smelly 1973 F-150 I get behind at 7am remind me of sausage. This morning I tossed the MinusCar Bike frame and fork into the trunk and headed off to work. Ha! I fooled you! This morning I bungied the MinusCar Bike to my backpack and headed of to work on my bike. It’s true, I’ve been inspired by stories like this from the Oil/Sissies guy. On my way I noticed a guy camped out under a tree along the river on the edge of shopping central. He was rubbing his eyes, just waking up. Good morning! For lunch I successfully delivered the bike to the LBS for removal of crank arms, pedals, headset, steer tube races, and cable routing devices. Interestingly the shifter mounts appear to somehow pierce the downtube. It’s not clear what anchors them in place. It is clear that removal of them would leave a hole through the frame. My Pal Pel thought maybe he could find some covering caps to neaten it up a bit. I can only hope the caps come in the form of bones or skulls. Yeah! It was very nice to finally be rid of the weight of the extra bicycle as I headed to Staples. I purchased two ink cartridges and was pleased-nay-surprised to learn from the cashier that I was due a ream of paper for each ink cartridge purchased. We shared a mutual laugh as we both knew I’d be carrying it on my back. “Do you want them?” she asked. “Yes…NO!..of course.”, I replied. It’s the good stuff too; HP brand paper. One ream is 5.5lbs. Next was Best Buy for some headphones followed by KFC for two original snackers with BBQ sauce. To go. Then back to work. This one made a lot of people’s yearly best lists. It was good. It was original. It was even generally entertaining. But I’m not sure I was convinced of its “best of” status. It is the classic. Before checking with IMDB I guessed this move was made in 1977. I sure was surprised to find a 1968 date attached. What a surprise! Special thanks to Disney for introducing suicide in the form of Herbie trying to throw himself off a bridge. Because of a road trip with my wife and friends, Friday, Saturday and Sunday aren’t reflected in this report. The one mile was to school and back to pick up The Boy 7. The Boy 3 was with me. I’m really torn on whether this is a justified trip or not. It’s seems pretty sad that we couldn’t just walk this, but then 1 mile for a three year old is pretty far, and we’d probably be late for the pick up. Sigh. 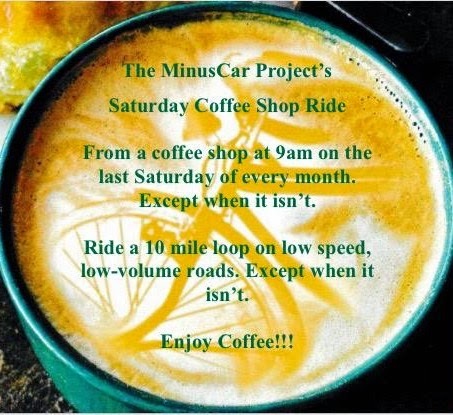 The MinusCar Bike Project. Go. It turns out that ramming the racing bike into the garage with the car (like I did in August) isn't good for precision crafted Cannondale HeadShocks. The Cannondale factory has confirmed what I already knew after half a lap racing the 24 Hours Of Afton. The lousy feel of the bike was due to a bent thingamajig, and the thingamabob ain't looking so good either. Bottom line - full frontal replacement is necessary. There's a slight chance they'll be able to match the new shock with the bike's existing paint scheme. By slight chance I mean no possible chance whatsoever. What' s a guy to do? Get a carbon Lefty that doesn't have to match? I'd rather buy a $700 bike than spend $700 for half a fork. Replace the complete bike and buy a Rush? Something will die in me the day I purchase a full suspension bike. The correct answer is paint the whole bike. The MinusCar Bike Project has begun. The new paint scheme will be the official MinusCar paint scheme, including MinusCar logo, MinusCar slogan and MinusCar URL. By the way, I have ideas for a logo but not enough graphic talent. Help? This is a very old Cannondale road bike that I got from a friend for a very good price. I've been planning to turn it into a road single speed. I'm going to practice on this. First step, make the frame naked. I was surprised to find Suntour Edge components on the bike. You won't find them in a bike store near you. The cranks, shifter mounts, and cable routing devices remain attached. I need to consult with the consultants for removing them.